Why squeeze into crowded buses and trains when you can travel in absolute luxury, with your very own chauffeur, at the best possible prices! Why wait in the scorching heat, when you can just sit back and relax and arrive as cool as ice? No more crowded trains and buses, no more at the mercy of auto rickshaws. Get door to door service at the tap of of your fingers for a hassle free travel experience without hurting your wallet. Travel in style, arrive on time, every time, all this at a cheaper price than rickshaws. Prepare for your meetings, listen to your beats, sleep at ease all on the go. All you have to do, is call a cab! Choose your pick from a variety of service providers like Ola, Uber, MegaCabs, EasyCabs, GoCharlie and more! 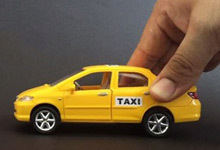 RailYatri brings flat Rs 300 discount on Delhi to Agra taxi service. Use this coupon code on your first outstation cab bookings to get flat Rs 300 OFF + 5% Cashback via mPesa. Book here using offers from HappySale to enjoy tension free rides along with huge discounts. Grab all the limited period RailYatri discount codes today. Hurry Up! This wedding season, request a HIRE or HIRE XL car and let us drive you around from one stop to the next without the hassle of multiple bookings. Uber is Offering 50% off up to Rs 150 on your first HIRE or HIRE XL ride in Delhi NCR by Using the code. This is only valid in Delhi NCR. Before it goes expires ride now. Hurry! This month, enjoy POOL rides at Rs 59 or less for trips up to 9 kms and Rs 99 or less for trips up to 19 kms anywhere in Delhi NCR! Lower fares will be visible upfront. No need for additional promo code required. Each request can have a maximum of 2 riders per pick up. Ride now. Hurry Up! Verified on 23/4/2019 .. Makemytrip has launched cab services. Get flat Rs 200 off on your cab bookings at mmt. Check more details at landing page. Apply promo code at check out page to get discount. No calling a cab or waiting in taxi lines.. get a free Uber ride today! Verified on 23/4/2019 .. Now get flat 10% off of up to Rs 300 discount on your cab bookings at mmt. Check more details at landing page. Apply promo code at check out page to get discount. Verified on 23/4/2019 . Get 25% cashback on Ola rides when you pay with Freecharge UPI. No minimum transaction amount is required. Maximum cashback of Rs 50. This offer is ?valid twice per UPI ID. Grab now. Uber is Offering Flat Rates to and fro from Delhi Airport. So for the next 2 weeks, if you have a flight coming up, look no further than Uber Intercity between Delhi NCR and Chandigarh. You can request an Uber Intercity, anytime between 5 AM and 11 PM, that picks you from the airport in Delhi NCR and takes you anywhere in Chandigarh. This Special Fare of Rs 2299 is only applicable on riders to and fro from Delhi Airport. Book Uber Now! The 21st century lifestyle makes it easy for us to get anything we want online and also save a good amount whilst buying the same! The same applies to getting cabs as well. If you have the habit of wanting to travel on your own and enjoying your space in doing so then there is no reason as to why you should keep travelling in bus and train where there is such huge traffic, where you have the option to get the best of the cab service. And if you are one who loves to spend on budget you can make the most of the cabs coupons that are listed online! For those wondering where to have access to the best of the discounts and offers on cabs, you can make the most of the deals and offers listed in HappySale. Here you will find plenty of deals from some of the popular brands such as Ola, Revv, Zoomcar, Uber and many more that you have the complete liberty to browse through the offers and select the one that best caters to your needs and requirements. The discounts keep on changing from time to time so that you have the chance to select from the fresh offers! When you select and activate the cabs promo codes of your choice you have the chance to enjoy some of the best discounts. For instance, the discounts help you to save as much as Rs.200 on your cab bookings. When you book using the discounts provided by Zoomcar, then you can get Rs.600 off on the very first rental online. Similarly, there are other promotional offers, cashback deals, site wide deals and many more. Get the best offers that are listed online for you! If you are wondering whether it’s tough to activate these offers and discounts, then it is very easy! All you have to do is make the most of the deals and offers and then click on the “show code” option which will reveal to you the discount code. Once you do that you can then use this code when you are making the final payment and get the discount that was in store for you. If you want to make the most of the cabs coupon codes, all you need to do is keep browsing through HappySale as here the best offers are available. All the offers are authentic here. So read through the deal descriptions and you can activate the same prior to the deal expiry time.